Chalet 7 Mlibizi - Mlibizi Accommodation. 13/18 - Main entrance in to bar. 18/18 - Kariba Ferry's "Sea Lion" docking just below Chalet 7. All three bedrooms come complete with bedding, linen and towels, ceiling fans, mosquito nets and gauzed windows. Two of the bedrooms, including the master suite, open onto the deck which looks out on the water – perfect for catching the beautiful sunrise over the bay. The master suite is furnished with a king-sized bed and full en-suite bathroom. The second bedroom offers two single beds and full en-suite bathroom while the third bedroom provides two single beds and a shower in the en-suite. A car port provides covered parking for two cars. At the entrance a staircase leads you down to the main entrance through the lush front garden. The open plan multilevel living areas include a full bar, dining room and lounge that lead to the fully equipped kitchen and separate scullery and pantry area. The bar contains a brand new double door fridge and deep freeze with ample storage for ice, drinks, meat and the all-important catch of the day. The kitchen holds every appliance you could need including a washing machine, gas-electric stove, fridge and microwave. The lounge is also fully furnished with TV with DSTV access – just bring your decoder and smart card along with you. The lounge also opens out to the deck and leads to the elevated veranda and braai area. The veranda features a full table and chair set seating eight people for al fresco dining, enjoying your fish with a view and taking in the fascinating night sounds that echo over the water. Down the steps to the water you will find your own private jetty. The entire house is cooled by an environmentally friendly evaporative cooling system – just as efficient as air conditioning but much kinder to the protected environment of Mlibizi Bay. The house is enclosed within Mlibizi Zambezi Resort which offers additional facilities for launching your boat, a communal swimming pool located next to the house, a supermarket for your basics, a bottle store and pontoons for hire for fishing and cruising. Mlibizi Zambezi Resort is situated directly next to the Kariba Ferry dock for easy access. 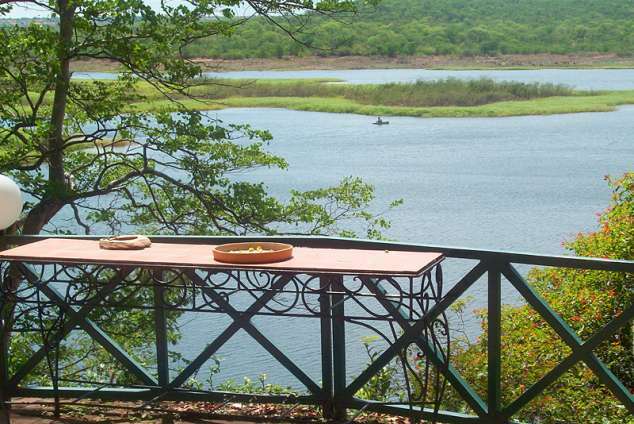 Detail description : Chalet 7 is the ideal accommodation for guests boarding the Kariba Ferry. Fishing in Mlibizi Bay, Lake Kariba and Zambezi River for the enthusiastic fisherman either from your own boat or one of the pontoons for hire. No restrictions on boat motors. 3190 page views since 25 Sep, 2015. Last updated on 02 Oct, 2018.